A scorpion is a pet you can never hold. He won't learn to recognize or interact with you, but he will make up for his lack of cuddliness by providing your with hours of fascinating observation. Scorpions are either jungle species or desert species. Since the habitat and care differ for the two types, it's crucial to know which type of scorpion you have. For beginners, the Amateur Entomologists' Society recommends large, jungle species such as emperor scorpions (Pandinus imperator), Thai black scorpions (Heterometrus spinifer) and Javanese Jungle scorpions (H. javanensis). Place a 2- to 4-inch layer of substrate in the bottom of the aquarium. Use clean, chemical-free sand for desert species. Use a finely ground organic substrate covered with a thin layer of coarse bark for jungle species. Mist organic substrates with a fine spray of water until they are moist but not wet. Add a flat rock or ceramic ornament to give your scorpion a place to hide. Other ornaments aren't necessary for the scorpion but may add to your enjoyment. Place a shallow water dish in one corner of the aquarium and keep it full for jungle species. Remove the dish with tongs and wash it thoroughly with soap and water every few days. For desert species, provide a damp piece of natural sponge in the corner of the aquarium. Some species can get all the moisture they need from the air, but if you aren't sure about your scorpion, it's best to give him a sponge. Attach a heat mat to the side of the aquarium with tape. A heat mat designed for use with reptiles is ideal. Place the container that holds the scorpion inside the aquarium and cover the aquarium with a tight-fitting habitat lid. Secure the lid in place with aquarium lid clips. Remove the container with tongs once the scorpion moves out into the environment. Mist the substrate in jungle habitats daily. Desert habitats rarely need misting. Feed the scorpion once or twice a week, at night. Feed small scorpions small crickets, or pinheads. A large scorpion will eat three to five adult crickets per week. Remove uneaten crickets after a few hours. Be aware that uneaten food may indicate illness or improper habitat, so consult your specialist.  Some sources suggest placing a heat mat in the bottom of the aquarium and covering it with substrate. Be aware that this can place your scorpion in danger: When conditions are too hot, he cools himself by burrowing into the substrate, which would bring him closer to the heat source rather than away from it as intended.  Safe substrates for arthropods is available at pet stores. Avoid products packaged for gardening. 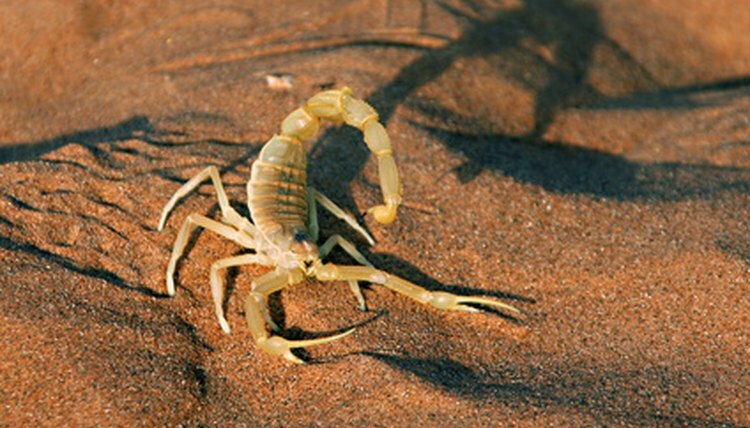 These products often contain insecticides, herbicides and fertilizers that are harmful to scorpions.  If you must handle your scorpion, use a long pair of foam-tipped tongs. ⚠ Most scorpions sting. Severity ranges from the equivalent of a bee or wasp sting to death. The emperor scorpion and two Heterometrus species deliver mild venom that isn't generally harmful but is very painful. Scorpions move quickly, so you should take care when maintaining the habitat and never handle a scorpion. Scorpions are not appropriate pets for children.